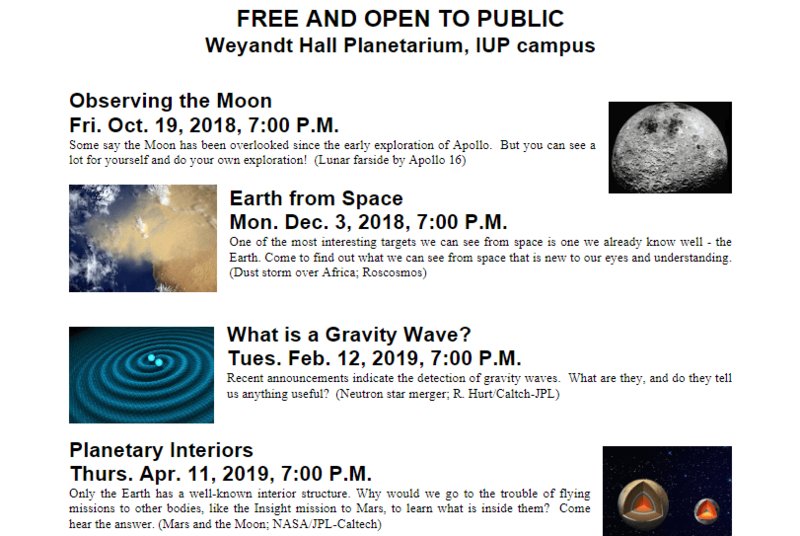 There will be a free show in the IUP Planetarium on Monday, Dec. 3rd, 2018 at 7:00 P.M. The show will be “Earth from Space.” One of the most interesting objects we can study from space is the Earth itself. Go and sample the things that only spacecraft can show us. They will also look at the current stars and planets in the sky. The show is open to the public, and I expect the show to run about 40 minutes. If weather permits, they’ll take a telescope outside afterwards for a brief look at the night sky. The planetarium is in the east side of Weyandt Hall (the side away from the Oak Grove). Doors open at 6:45 P.M. Seating for the shows is first-come, first-seated. 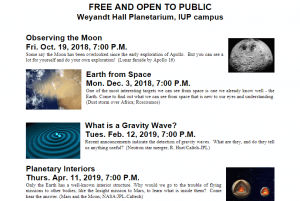 The attached poster gives the full schedule of public shows for this academic year, including upcoming shows on Feb. 12 and April 11.